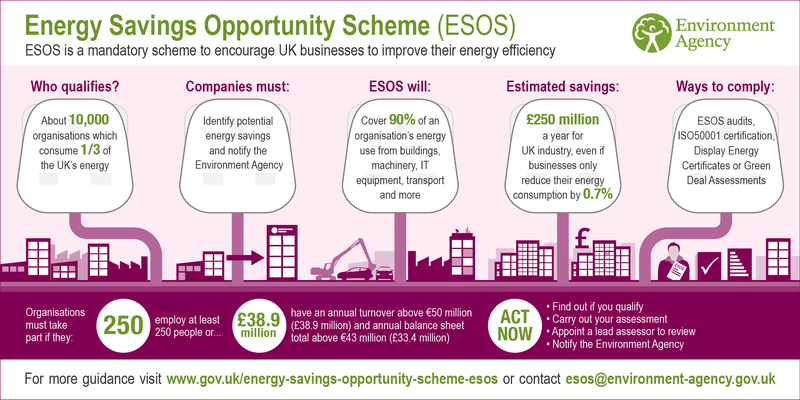 The Energy Savings Opportunity Scheme (ESOS) was established by the UK Goverment to implement Article 8 (4 to 6) of the EU Energy Efficiency Directive (2012/27/EU). The ESOS Regulations 2014 give effect to the scheme. 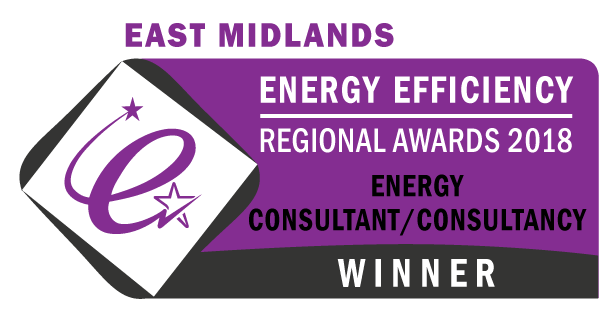 ESOS is a mandatory energy assessment scheme for organisations in the UK that meet the qualification criteria. The Environment Agency is the UK scheme administrator. Organisations that qualify for ESOS must carry out an ESOS assessment every 4 years. These assessments are audits of the energy used by their buildings, industrial processes and transport to identify cost-effective energy saving measures they can implement to reduce their energy demand. The entire audit process must be supervised by an accredited ESOS Lead Assessor. Organisations must notify the Environment Agency by a set deadline that they have complied with their ESOS obligations. The deadline for the first compliance period, 5 December 2015, has now passed for organisations that qualified on 31 December 2014. However, organisations need to start planning now to meet their obligations for the next audit due in 2019 for organisations meeting the qualifying criteria on 31 December 2018. Whether you have missed your first deadline or you are ready to begin preparing for the next, our lead assessors can guide you through the entire process. They will discuss your business with you to gain an in depth understanding of your operations before helping you plan your audit process. You will need to decide the information you are going to collect and how you intend to meet the requirements. Our team will offer advice and support to allow the entire process to be completed as efficiently as possible. After all, it's all about saving energy and we don't want you working harder than you have got to. What are the ESOS qualification criteria for organisations? ESOS applies to large undertakings in the UK and their corporate groups. It mainly affects businesses but can also apply to not-for-profit bodies and any other non public sector undertakings that are large enough to meet the qualification criteria if they are engaged in any “trade or business activities”. any organisation which has fewer than 250 employees, but has an annual turnover exceeding €50 million and a balance sheet exceeding €43 million. For the purposes of ESOS, the term employees includes employees and other persons engaged in the business of the organisation such as owner-managers and partners. For a UK registered undertaking, this includes all employees contracted to the undertaking either in the UK or abroad. For a non-UK registered undertaking with a UK establishment it includes all those contracted to the undertaking who are subject to income tax in the UK. Please note, this is also the total number of employees regardless of the number of hours worked or contracted (not the number of full-time equivalent staff). You must take part in ESOS if your undertaking is part of a corporate group which includes another UK undertaking or UK establishment which meets these criteria. Where a corporate group participates in ESOS, unless otherwise agreed, the highest UK parent will act as a ‘responsible undertaking’ and be responsible for ensuring the group as a whole complies. UK registered establishments of an overseas company will also need to take part in ESOS (regardless of their size) if any other part of their global corporate group activities in the UK meet the ESOS qualifying criteria. Your organisation qualifies for the compliance period (phase) if, on the qualification date, it meets the ESOS definition of a large undertaking. Corporate groups qualify if at least one UK group member meets the ESOS definition of a large undertaking on this date. All qualifying organisations must submit their completed report to The Environment Agency by the compliance date or they may be subject to substantial penalties. If you are very close to the qualification threshold or have substantially increased or decreased in size in recent years you should read the full guidance to confirm if you qualify. For more information on organisations that do not need to comply see section 1.2 of the full ESOS guidance. 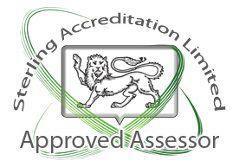 Alternatively please feel free to contact us for a no obligation discussion with one of our ESOS Lead Assessors. Public bodies are not included within the scope of ESOS as their energy efficiency is governed by a separate process involving regular Display Energy Certificates. To find out more – click here.